When you need to effectively remove water from an area there’s nothing better than a foam or floor rubber squeegee. These tools are great for pushing large amounts of water towards floor drains and any other type of drain. In addition, these floor squeegees can be used on a variety of floors including concrete, asphalt, and just about any other smooth surface. One popular floor squeegee type uses a foam material for the squeegee blade. The squeegee rests in a cast aluminum socket which can either be straight or curved, depending on the intended application. Straight squeegees are ideal for moving large volumes of water while the curved squeegee blades are best suited for directing water towards floor drains. They come in a variety of sizes from 15 to 48 inches to fit even the largest areas and their foam blades can be replaced after they wear down over time. The second type of floor squeegee is better suited for heavier applications such as meat packing plants and supermarkets due to their rubber blade construction. As with their foam counterparts, these squeegees are available with either straight or curved blades. When it comes to cleaning concrete or asphalt surfaces these are the ideal choice. The rubber blade withstands the rigors of daily use better than the foam blade. Since a floor squeegee is subjected to regular use they have to be rather sturdy to stand up to regular use. Most units are constructed of 14 gauge aluminum and have either wood or fiberglass handles for added durability. Maintaining these tools is a snap since either the rubber or foam blade can be cleaned with regular soap and water. Their easy maintenance and durable construction will ensure that you’ll get years of use of out of your floor squeegee. The beauty of these tools is the efficiency in which they can clean large floor areas in a relatively short period of time. The larger the blade, the quicker you can complete the work. It’s no wonder that these tools are used by food service facilities since they clean their floors on a weekly basis. Their ability to handle various applications is what makes them an ideal choice for hospitals and construction sites as well. 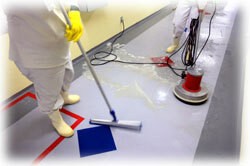 The use of a floor squeegee can be applied to several different applications and surfaces with outstanding results. Not only are these squeegees great on tile and hard surfaces but they work will on unusual surfaces well. For example, most people don’t realize that the PGA uses foam squeegees to help dry the greens and tees when rain interferes with a tournament. The squeegees are great for diverting water off the greens and tees without damaging the surface. It’s no wonder that people love this inexpensive yet useful tool for a wide variety of applications in addition to their cleaning equipment like floor scrubber machines. After all, it’s rare to find a piece of equipment that works just as well on a hard tile floor as it does on a soft putting green.